Phoebe “Kathleen” Ralph, age 88, died Saturday, December 1, 2018 at Golden Heights Personal Care Home in Irwin, Pennsylvania. She was born on November 9, 1930 in Jefferson Borough, Pennsylvania, one of four children of Walter Raymond Ralph and Kathleen (Hines) Ralph. Phoebe grew up in Jefferson Borough and attended Jones Elementary School and Clairton High School, graduating in 1948. 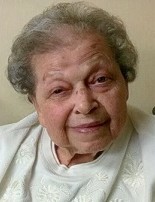 She lived many years in White Oak, Pennsylvania and was a longtime employee of Bell Telephone, starting as a switchboard operator, then a draftsman and finally a computer aided draftsman. She was an avid wood carver and a member of the Mon Yough Wood Carvers, the Pittsburgh Wood Carvers and the Chisel and Chips Carvers of North Pittsburgh. She was also a member of the Olivet Presbyterian Church in West Elizabeth, Pennsylvania. In addition to her parents, she was preceded in death by her sister, Earlene Laird, brother, Robert W. Ralph and niece, Betsy Laird. She is survived by her brother, David Ralph of Clairton; six nieces and nephews, Barbara (Jesse) Schreiber, Kathi (Robert) Menzies, Kim (Rocco) Curinga, Judi (Steve) Slater, Harry "Buddy" Laird and Robert (Cindy) Ralph; eleven great nieces and nephews and nine great-great nieces and nephews. Friends will be received on Wednesday, December 5, 2018 from 9:30 until 11:30 AM at which time her funeral service will be held in the Stephen D. Slater Funeral Home 1701 Route 51 (Large) Jefferson Hills 15025 (412-384-0350). Her burial will follow in Round Hill Cemetery in Elizabeth Township, Pennsylvania. Pastor Marty Smith will be officiating at her funeral service and burial. Phoebe’s family would like to thank the Golden Heights staff for their loving and patient care of her in her last years and the residents for their friendship. Also, a special thanks to Vicky DeLuce for her faithful friendship. Donations may be made in Phoebe’s name to the Heritage Hospice Legacy Fund, Heritage Hospice 2400 Leechburg Road, Suite 300, New Kensington, Pennsylvania 15068-4676. Please make checks payable to “Community Hospices of America.” Community Hospices of America Foundation, Inc. administers the fund for it to be tax deductible.